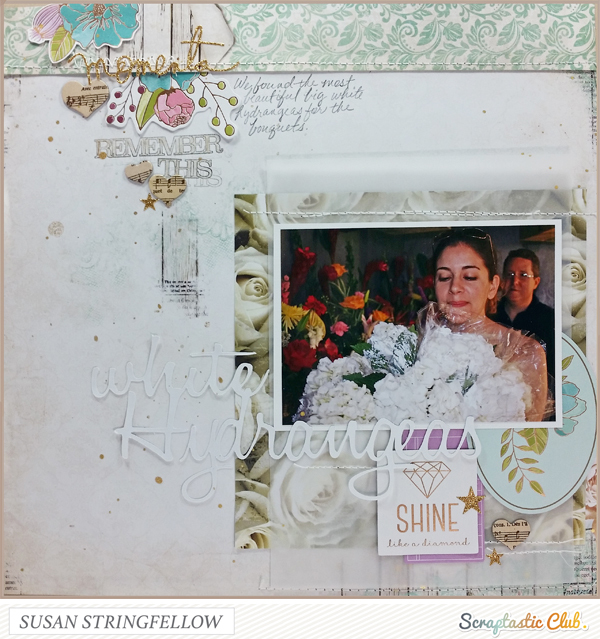 I have two layouts to show you that I shared on todays Scraptastic Club Blog. First if you haven't seen the March kits, check them out HERE! You just have to see the sparkly springy "Rivers and Roads" kit and Add on kit that I have used for my two layouts. First I have to apologize for my layout photos this time as I had to take them indoors and they just do not do the layouts justice. This first layout is my sister when we found the huge hydrangeas for her wedding bouquets so I chose to keep the page light and soft. I chose this nice light background print and then cut the top 1 1/2" and reversed it because it coordinates so nicely. The floral die cut pieces that are peeking out from the top of the page and the strip of patterned paper are actually one die cut that I have cut in half to appear to be two elements. I wanted to use the "Remember This" image from the Rivers and Roads stamp set without it being too bold, so I inked the stamp with black ink, stamped on a scrap of paper and then onto my layout a couple of times. I painted a sheer amount of gold mist using a paint brush inside the letters. The rose patterned paper was perfect under my photo, but to soften it a bit, I added a piece of vellum from my stash. So many of the die cuts in this kit have the bronzy gold foil accents for just a little shine, but they are tricky to capture nicely in a photo. For my second layout I was totally inspired to scrap a couple of my photos of Marie because of the awesome pink bows in the kit! I just love those bows and this has to be the most perfect use. This Time I used the "Remember" stamp as sort of a design element by stamping it a few times under the piece of white cardstock piece I cut and the teal dot transparency. The "favorite" element is a chipboard piece that I layered over a gold foil wreath shape sticker and the you and me is also a sticker that I mounted with adhesive foam tape. There are so many wonderful little pieces like these in this kit. I just loved the pink camera sticker but it was looking flat next to the bow and puffy scallop so I attached it with adhesive foam tape. If you are loving little gold accents as much as I am lately, this is the kit for you! Susan, I just adore your layouts! I'm working on cleaning out my craft room so that I can move a large table in to scrap more. You truly inspire me!